Conflicts between parents and teens are nothing new. Whether it's curfew, cell phones or even friends, conflicts can and will arise. How well teen and parent problems are handled, and the strategies used can make all the difference. Reasons for problems between teenagers and parents vary greatly since each situation is different. However, there are a few common areas where teens and parents find the most conflict. Teens are striving to find independence anyway they can. From fashion to activities, teens want to control their lives. Since teens are trying to learn how to be an adult and navigate the world without parental supervision, this is a common problem to arise. Keeping the balance between letting your child make choices and keeping them safe is like walking a never ending tight rope. Lean too far either way and you're bound to lose. To help keep balance, talk with teens and try to understand why they choose the music, cloths or activities they do. Set limits that still allow teens to express themselves in safe ways like dying their hair blue or starting a garage band. Going along with asserting their independence, teens are ready to prove their point. Whether they are told they can't go out today or they need to do their homework, adolescents are ready to argue. Not only do they want to discuss a perceived injustice, but many times they feel parents don't trust them. Rather than arguing, it is important to listen to your teen. In a calm voice, try to understand the point that teens are trying to make and work to compromise rather than argue. Many times, it feels like parents and teens are on two different planets or speaking two different languages. Phrases like "you don't understand," or "it's like you don't even listen to me," are phrases parents hear over and over. Teens don't feel that parents listen to them or understand their feelings. To wander through the murky water of communication, it's important to listen to teens. Rather than blasting questions at them, make general conversation and listen to what they have to say. It is also important to validate their feelings. Rather than just saying, "no" listen to why they broke their curfew or want to attend that party. Boundaries are important for teens to grow up healthy and happy. Teens, however, are testing their limits. They are trying to push their boundaries and wade the murky waters of the adult world. They want to see if parents trust them and find their limits. Rather than setting unrealistic boundaries, it's important for parents to talk with child and set boundaries that are realistic. These boundaries like curfew and cell phone use should be enforced consistency. However, if rules are broken, you need to listen and understand why they were broke and modify the consequences based on that. Emotional management isn't just important for teens but parents too. Teens are excellent button pushers. It's important to remain calm when even if your teen isn't. Remember teens are growing and changing and emotional control isn't fully developed. For your teen to remain calm, you need to remain calm. Rather than arguing and letting your emotions get the best of you, take five minutes and calm down. Teens are going to experiment. Whether they're driving fast or experimenting with drugs, risky behaviors can lead down a slippery slope to injury or addiction. This can come from asserting independence, stress, boredom or just curiosity. However, this is something that needs to be kept in check. Psychology Today notes that experimentation isn't healthy or the norm for teens. Not only is it important to talk with teens about risky behaviors and the consequences, but you need to watch for signs of addiction. As a parent, you want your teen to be able to do their best. However, demanding perfection in grades, sports, behavior, etc. can be harmful for teens, according to Dr. Jessica Naecker. While you want kids to do their best, parents need to understand when a student is trying and praise the effort rather than the grade. For instance, if your child is trying to complete chores or studying for a test, praise this effort. While the chore might not be perfect or the grade might not be an A, understanding and appreciating their effort is important. Friends can be a tricky subject for both teens and parents. Parents want their children to hang out with the right kind of crowd. But teens want to be able to make their own friend choices. While hanging out with the wrong crowd can be worrisome, parents need to focus on their teen's behavior rather than the behavior of their friends. Set clear boundaries and have a faith that your teen will make the right choices. Help your teen navigate through friendships that might be toxic to them in a calm loving manner. Not every problem will be the same or need the same tactic. However, there are some general tips that you can use to resolve problems with teens. Listen to their point of view. Whether it is about friends, relationships or broken rules, give them a chance to explain themselves and understand the consequences of their actions. Trust their decisions. Trust is important to teens. They want you to see that they are making good choices. In order to do that you need to trust them. Know the difference between healthy and unhealthy behaviors. While you might not like it, getting a piercing or dying their hair black isn't going to hurt them. Let them express themselves in healthy ways. Compromise rather than command. Teens need to know that their voice is heard, and they are playing an active role in their lives. When it comes to punishments, work together to make them fair. Discuss actions and consequences so they can see why a specific behavior is harmful. Promote positive behavior. It can be easy to get caught up in a teen's negative behavior, but it is important to complement the behavior you want to see. Rather than only focusing on when a child doesn't complete chores, focus on when they do. Complement teens for the four As they received on their report card rather than focusing on the one D.
Be firm but not impenetrable. It's important to be firm, but not overly firm, since this may make a teenager want to rebel even more. Make time for one another. Set aside time just to talk to one another. Whether it's taking a walk, playing a game or having dinner. Sometimes teen and parent problems become so big you can't handle them on your own. Knowing where to look is important before teens get out of control. Talk to your child's pediatrician. There might be something mental, emotional or behavioral going on with your child. A pediatrician can point you in the right direction. Seek a family or child therapist. These professionals can help you and your child work together to bridge the communication gap. They also offer coping tips that you both can try. Find a support group. Sometimes parenting groups can help you and your teen learn ways to work together. Parents and teens are on different planes most of the time. 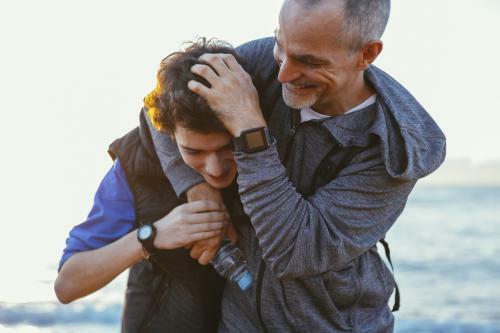 While parents were a teenager once, they've forgotten many of the stressors and experiences that their teen might be going through. Teens also can't understand the choices their parents make because they haven't reached that level of growth. Therefore, lots of different problems can crop up. With a lot of patience and a smidgen of luck, both parents and teens can find a way to bridge the gap.